Security analysts receive hundreds, if not thousands, of security alerts everyday, generated from SIEMs, TIPs and numerous security point solutions. This deluge of alerts is constant and overwhelming, from simple password access denials to more serious malware and phishing attacks. 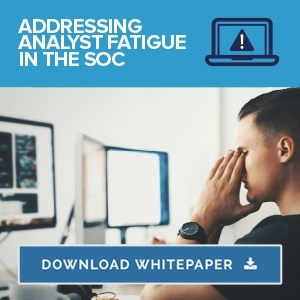 Without more security analysts staffing the SOC, there are simply not enough hours in the day to manually review, investigate and remediate all of the alerts that are generated. Many security analysts are forced by limited resources to select the most dangerous-looking alerts for further review, hoping the vast majority of alerts they don’t get to are rudimentary, commonplace or less harmful. The problem is that a single, seemingly-innocent alert could contain the clues to identifying a potential breach that could cost the company millions of dollars in lost intellectual property, customer data or brand reputation. According to the Ponemon Institute, less than 10 percent of security alerts are actively reviewed by analysts because of resource limitations, resulting in significant risk exposure for organizations worldwide. Syncurity’s IR-Flow security operations platform was purpose built by security analysts for security analysts to address the challenges of alert overload. IR-Flow combines security orchestration, automation, alert handling and incident response into a single, unified security solution that allows analysts to triage large volumes of security alerts, rapidly reduce false positives and escalate high-risk incidents for containment and remediation within minutes. IR-Flow is the industry’s only platform that separates alert handling from incident management, applying a patent-pending Triage Scoring Engine (TSE) to effectively “burn down the alert haystack” for manual and/or machine inspection. IR-Flow improves the effectiveness of limited resources, allowing analysts to put their skills to their highest and best use on critical alerts, instead of focusing on less important alerts or manual, repetitive tasks.